This was a "goal-oriented design" project for my authoring interactive media class. The only criteria was that our site was to act as a "how to." 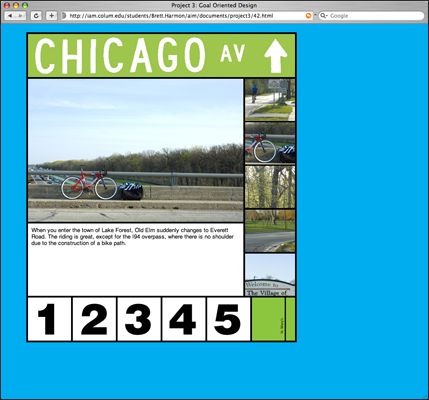 I chose to do a guided bike tour from Chicago to Kenosha, Wisconsin. After doing the ride myself while taking extension notes and photographs, I broke the trip up into five stages. With in those five stages, I broke down five individual steps. I sketched and mocked up many different ways of presenting this information in a unique format, before finally settling on the current design. Click on the image to be linked to the site.